Welcome to our first public garlic sale, which will be open from 8am-6pm Friday, Saturday, and Sunday of this 3 day event! This sale is giving you an opportunity to see where the garlic is grown while supporting your local farmer. Our garlic is grown using sustainable farming practices using no pesticides. The garlic is harvested by hand and then allowed to cure for several weeks before selling to give it optimum shelf life. 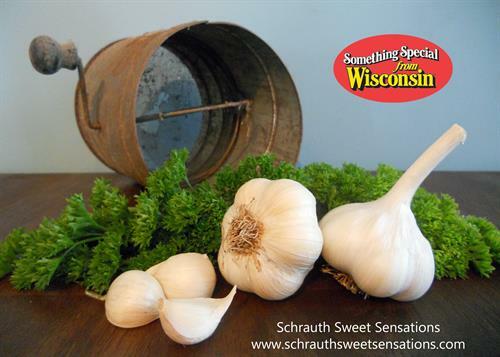 We offer 12 different types of fresh garlic that range from mild to spicy in flavor to accommodate every culinary taste. In addition to gourmet garlic, we also offer raw honey and pure maple syrup. Friday August 10th, Saturday August 11th, Sunday August 12th. 8am-6pm Daily.